Founded in September 2011, Snapchat continues to evolve and innovate in a way that keeps the industry on its toes. From impressive uses of augmented reality to clever lenses and filters, the company logged over one trillion snaps in 2017. That’s more than all the pictures taken by smartphones in the world. Snapchat does not consider itself to be a social network, but in fact, a camera company. Its audience is passionate about communicating through photos and videos in a lighthearted way. Companies that thrive on the platform need to think visually and take their brand a little less seriously. Here are ten companies and campaigns creatively using the platform to reach and delight customers. Want your friends to think your social life is lit, even if you would rather cozy up at home? Casper’s late night snap hacks have you covered. 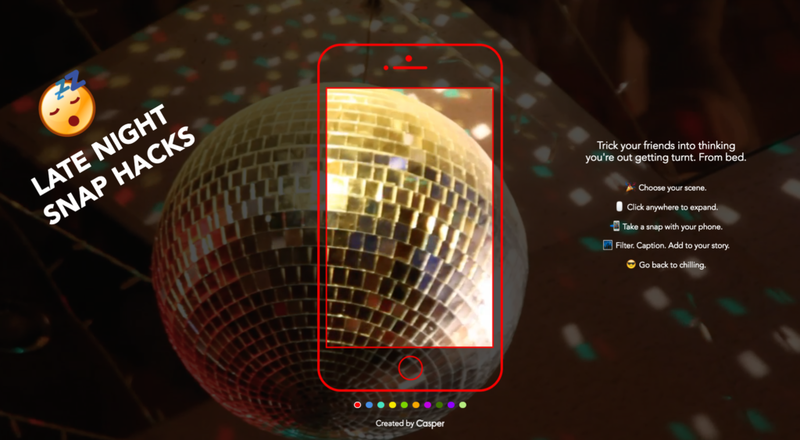 To help eliminate the pressure of going out on the weekend, Casper created a microsite called LateNightSnapHacks.com filled with snappable videos. Scenes include everything from a disco ball to people dancing at a club to driving through the streets of New York City. Just film the scene on Snapchat to create the illusion of a rockin’ night out. The result perfectly aligns with Casper’s quirky brand personality while adding value to its customer base. Arguably one of the most innovative Snapchat campaigns this year came from Netflix’s Stranger Things. With the first-ever 3D World Lens, Netflix created a virtual portal transporting fans into Joyce Byers’ eerie living room. Once inside the living room, fans could tap on different parts of the room, from the couch to wallpaper and colored lights. While the ad was only live for one day, it inspired fans of the show and marketers alike with the types of immersive experiences possible on Snapchat. Snapchat continues to lead in terms of what’s possible with augmented reality. As we look to 2018 and beyond, expect to see more companies leverage the platform to create these types of immersive experiences. Taking a page from the “Best job in the world” campaign from Tourism Australia, WOW Airlines offered its Snapchat-savvy fans a chance to win the ultimate summer trip to some of the airline’s 28 destinations. Dubbed the world’s first-ever SnapTraveler program, the campaign asked applicants to create a Snapchat story in English under two minutes, save the video file, and upload it to the company’s contest microsite for a chance to win. WOW selected four winners from around the world, who spent the summer creating content for the company’s social media channels, including Snapchat. The results? In addition to generating 10 million views across the brand’s social media channels, the contest also became WOW Air’s most shared news story with a total of 1.4 million social media shares. In addition to being a dream competition to win for fans, the contest is a great example of how a campaign can originate on Snapchat but also be re-purposed across multiple social media channels. Snapchat lenses provide incredibly creative opportunities for brands to showcase their personality and give fans a fun visual experience worth sharing. While countless other companies have tried their hand at clever lenses, Dunkin’ Donuts’ National Donut Day lens made this writer (and former employee) smile. National Donut Day is an important annual holiday for the company and a humorous lens that turns your head into a gigantic pink donut inhaling sprinkles just makes you smile. When coupled with Dunkin’s other activations, which included an influencer takeover of the brand’s story, plus custom geofilters which could only be accessed in-stores or via the “Snap to Unlock” feature, the company gained ten times more Snapchat followers on National Donut Day than their average monthly followers. 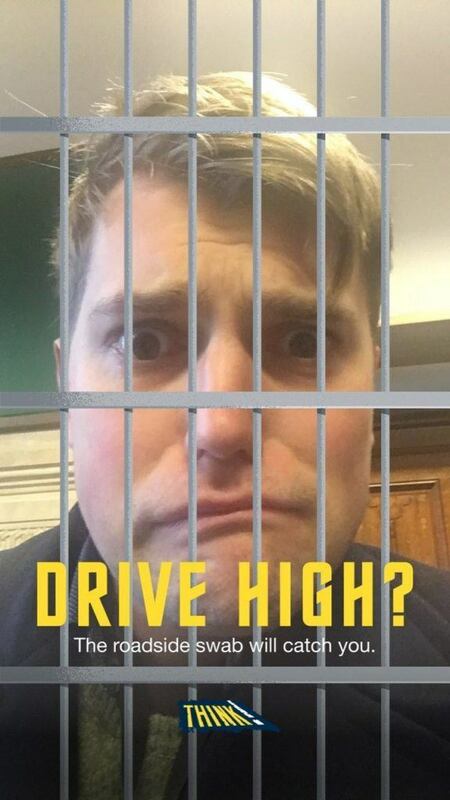 It remains the highest Snapchat story for the brand viewed to date. While there are many great Snapchat marketing case studies, the #WeAreCisco campaign provides one of the best examples of using the platform to highlight your company culture. Through social listening and sourcing stories for the company’s Life at Cisco blog, the company identified a core team of employee brand evangelists to launch the brand’s Snapchat channel in 2016. While the account is run by the company’s Talent Brand Social Team, employees volunteer to manage the channel on specific days and share unique Snapchat stories from their perspective. Since its launch, the company has had millions of minutes of Snapchat stories viewed with an average Snapchat story completion rate of between 60 to 70 percent. The company’s efforts have also inspired collabs with NASDAQ and the Grace Hopper Celebration of Women conference. 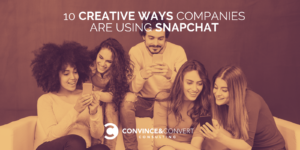 The campaign generated some controversy in the UK news media surrounding the government agency’s decision to spend money to advertise on Snapchat. Nevertheless, the geofilter generated more than 700,000 uses and 13.2 million views in one day, helping the UK Department of Transport reach their target male audience between 18 and 34. What if, for one hour, you could call the social media team of a company you admired—all via Snapchat? 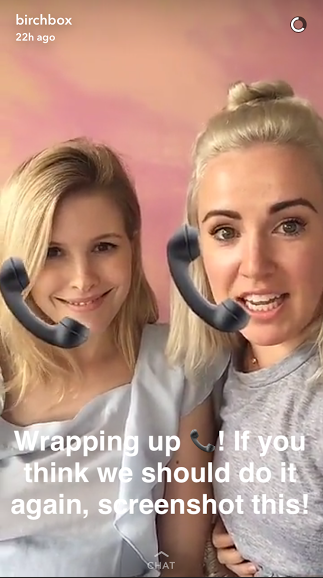 To test out Snapchat’s video chat and voice call features, Birchbox offered fans a chance to call them at a set date and time via a Snapchat story. After one hour, the Birchbox’s team had fielded around 30 calls and received requests to host them again, prompting the company to start hosting video and voice calls through Snapchat on a weekly basis. While this seems like a simple idea, it’s incredibly valuable for a few reasons. First, it puts a human face on the brand to facilitate new levels of connection with the company. Second, it’s valuable to customers looking for more personalized questions or recommendations. One-on-one advice from experts in the company is a great way to help convert more customers into subscription boxes or recommend à la carte skincare and beauty items to purchase. Want to hire a millennial or perhaps someone from Gen Z? Take a page from McDonalds’ playbook and recruit them on a platform where they spend most of their time: Snapchat. The campaign originated in Australia, where McDonald’s launched the initiative. The Snapchat lens mimicked the employee uniform and asked interested applications to snap a 10-second video detailing their enthusiasm for the job opportunity. Not only was the initiative successful, but it generated global interest and attention, prompting McDonald’s to launch Snaplications in the United States. During the summer hiring period in the United States, McDonald’s saw a 35 percent increase in application flow and a 30 percent traffic increase to the careers page due to the combined efforts of Snaplications and the larger marketing campaign. Only three percent of U.S. recruiters use Snapchat, but could this be the beginning of a larger trend? Grubhub, an early adopter of Snapchat, actively uses the platform to target its college student demographic with content, ads, contests, and even scavenger hunts. In its most recent campaign, the company has launched a retro-styled game called “Food’s Here,” where fans can play for a chance to win discounts. Users can access the game through an ad in Snapchat stories. If a player wins all three levels, they will score $10 off their first order of $15 or more when they download the Grubhub app. The ad will run for 30 days. Grubhub is measuring success across the length of gameplay, the swipe-up rate, offer redemptions, plus other actions taken after the game. 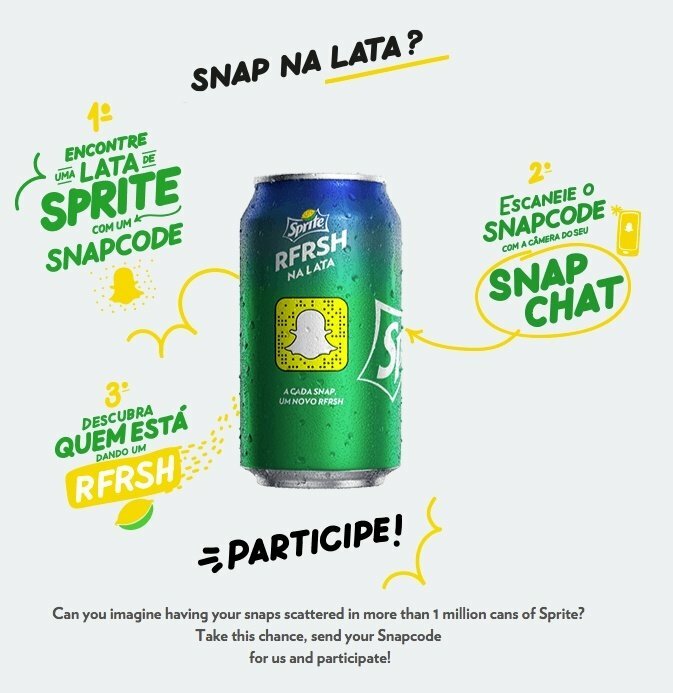 In Brazil, Sprite offered Snapchat influencers and fans an incredibly unique opportunity: a chance to have their Snapcode featured on cans sold across the country. Called “RFRSH Na Lata,” or “refresh on the can,” fans could enter by registering their Snapcode on a microsite. To raise awareness for the campaign, Sprite partnered with 15 influential Brazilian Snapchat stars to print their Snapcodes on cans, an effort which tripled many of the influencer’s fanbases over a two-week period. Featuring celebrities or fans on packaging or advertisements isn’t anything new (Wheaties box, anyone?). However, Sprite’s campaign shows that Snapcodes have made it cool—and actionable—again. The campaign generated over two million views in days and gave the company’s millennial audience another reason to enjoy a can of Sprite.